High temperature recorder, remote reading, with programmable speed and temperature ranges. 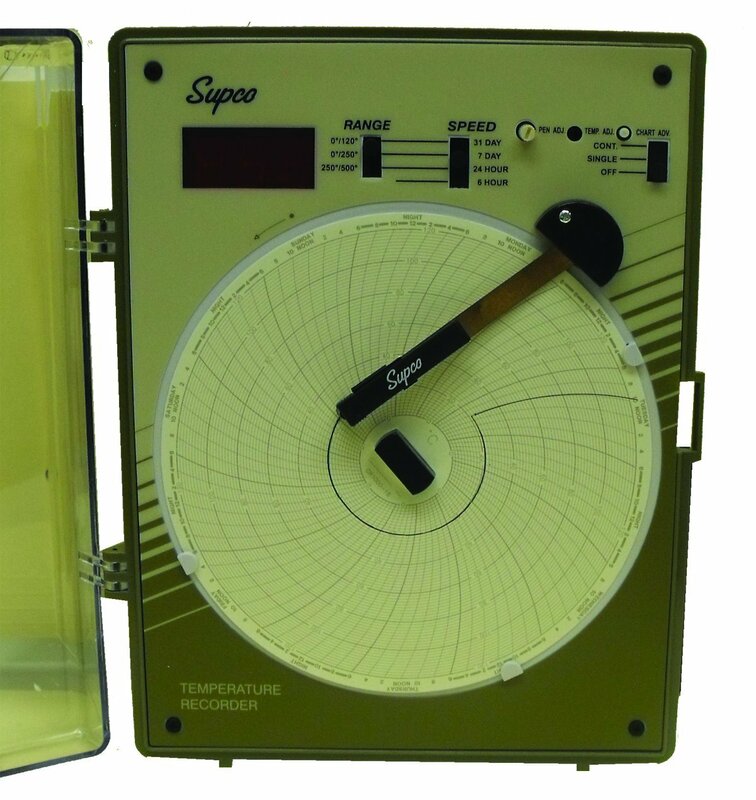 The Supco Temperature Recorder with remote sensor employs advanced microcontroller design that enables this versatile instrument to accurately measure and record temperatures in air, gas, liquids, powders, solids, and semi-solids. Recordings can be made from any distance up to 2000 feet away by using an optional long length thermocouple sensor wire. Selector switches located on the face panel allow for the recording of 3 different temperature ranges at 4 different recording speeds.. Standard adapter for 120 VAC operation. Battery backup assures normal operation during power interruptions. 12 VAC operation - allows use in vehicular or marine operations. Furnished complete with 2 cartridge pens and 60 (6" diameter) assorted charts. Convenient fold down carrying handle. Snap-on extra support legs. Free standing or wall mounted (using existing keyhole slots located on back of the case). Weather proof NEMA type 4X (CSA type 4) case optional. Temperature scale selectable: (Celsius) 0 degree C to 120 degree C, 0 degree C to +250 degree C, +250 degree C to +500 degree C. Ambient operating temperature range: 0 degree C to +60 degree C. Ambient Operating relative humidity: 96 percent maximum. Chart speed selectable: 6 hours, 24 hours, 7 days, 31 days. Chart rotation mode: selectable, single turn or continuous. Chart speed accuracy: +/- 1 percent. Display: 3-1/2 digit LED 0.5". Temperature sensor: 6' long high temperature type "J" thermocouple wire probe. Can not be used in liquid or semi-solid. Alternate power: 12 Volt vehicle operation with optional adapter. Battery backup: 8 AA Alkaline batteries (not included). Battery life: 48 hours continuous use. Recording pen: ink type. 110-120V Voltage.